I am very grateful to you for always being here for me. When I need you, you've never ever failed to be there for me and let me rant at you. When I am down, angry, happy or even when having mood swings. I will just turn to my blog to type. It's become a routine that I can no longer remove from my life even if I'm locked up in a blog rehab. Yes. I am addicted to you, my blog. I have stressed myself to do my best so that I don't let down my group members. Also, during these days, I have always been reminded to not lose to the people I don't want to lose to. Now, that everything is over, all my hardwork is to be judged. I feel so bare and naked. Other than this competition, I have also tried living a life of hate towards my ex-clique. To be honest, I failed. I can't hate them as much as I think I can. All I can do is trying to make fun of them, but everything is only apparent. Deep inside, I still miss those times we had. 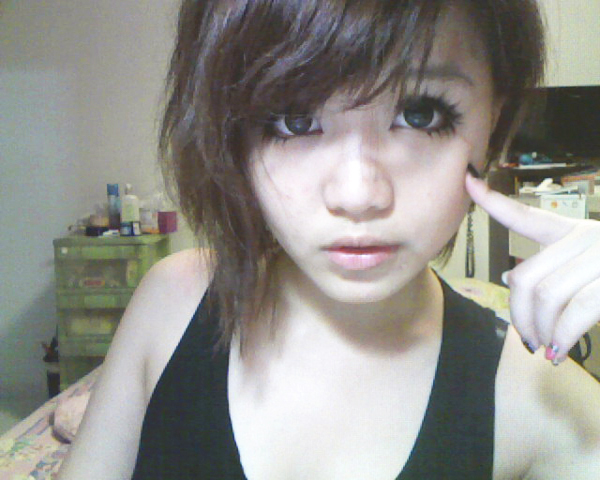 I just want to be a normal girl who shares make-up/fashion tips and search for make-up/fashion tips online. I want anonymous to look at what I want to share. Blog, can you just be my blog where I can share my feelings to? Blog, can you become a platform for me to share whatever I want to many many people who appreciates? It's so ironic, I want to share my life, my woes, my love, my rants and new things to people who love to know about them but I don't want to share my life, my woes, my love, my rants and new things to people who hates me and that wants to hurt me. Though, nothing is one-sided right? I can't get a win-win situation. I just want to blog on this space and rant and rant on how I feel, I just want to share new styles that I tried. Why is it that when I start ranting, hates starts coming in too? Yes, my rants are one-sided and there's a reason to why it is. It's selfish and unreasonable mainly because these are rants coming from me. Coming from this girl here typing this post and what's inside her mind. I must be thinking that way when I was typing that way but why are you scolding me? I don't want to be a blogger anymore, I only want to be a girl with a blog. Dear blog, thank you for all the experience you gave me and you have been through a lot of things with me. you might have also witness my changes in life. From a 16 year old kid to a 17 going 18 year old teen. The way I blog may change as I change, no one stays stagnant and stops changing. I may become a better person one day or I might even become someone worse. Determination to be better isn't enough. Finally, everything ended. I can lead my life like how I used to since the start of Feb 2012. No more hates, no more competition, no more "blogging stress". I will still blog up random things or pictures or food or whatever that is new. Though, I won't be blogging too often, you all can follow me on twitter @KiyomiLim or Facebook! I'll definitely put up there once I update. Or you can even subscribe to my blog using google! Up to you (: I just hope that you won't forget me. So I will just be who I was and lead my original life. Thank you all for being here with me through my thick and thins. Thank you blog, thank you everyone reading this.